Do Blood Sugar Levels Affect the Development of Sleeping Sickness? Written by: Dominika Trzilova on December 12, 2018. You have probably never met anyone suffering from sleeping sickness, a potentially fatal condition. This is because the disease, also called African Trypanosomiasis, is only present in certain regions of sub-Saharan Africa. While the number of human cases has dropped to less than 3,000 in 2015, Trypanosoma parasites can also cause disease in cattle, greatly affecting economic development in these rural areas. Sleeping sickness is transmitted by tsetse flies that carry the parasite Trypanosoma brucei. A recent study published by scientists from Clemson University aimed to better understand the switch between different life stages of T. brucei. While inside the fly, the parasite grows rapidly. 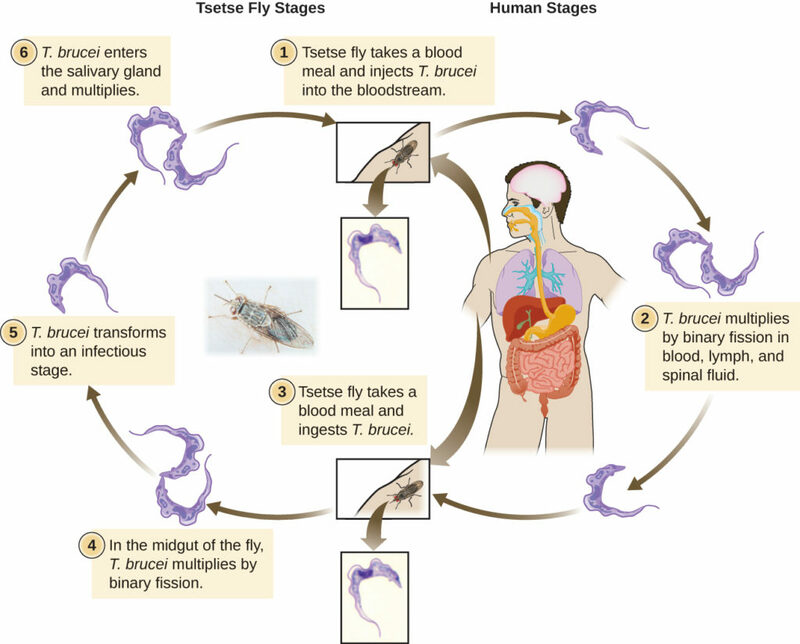 Following a fly bite, many T. brucei cells are transferred to the bloodstream of a mammalian host. There, the parasite remains ‘dormant’ and no longer replicates. The research group, led by Dr. James C. Morris, was interested in characterizing the mechanisms T. brucei uses to decide when to grow and when to remain dormant. Because the parasite lives in two very distinct hosts, flies and mammals, it must be able to adapt and use cues from its environment to ensure proper development and survival. Trypanosomes use the sugar glucose as a critical source of carbon – one of the building blocks for biological molecules. While the levels of glucose are quite high in the blood of mammals, they decrease rapidly after a blood meal by the tsetse fly. This prompted the Dr. Morris’ lab to investigate glucose as a possible signal that controls the switch between the form of T. brucei in flies (dividing) and mammals (non-dividing). Interestingly, Dr. Morris and his group found that if they grew T. brucei in laboratory media without any glucose, the parasite was able to survive, but it changed into a form adapted for survival in the fly. When this fly-adapted form was injected into mammals (mice), it was rapidly cleared by the immune system. This suggested that to avoid immune clearance, the parasite must sense its environment, including glucose levels, and change into a form infectious to mammals prior to or during transmission. Therefore, this sugar-induced switch could potentially be exploited for development of new therapeutics, which would mimic glucose depletion and should lead to improved clearance of the parasite by the immune system. It is currently unclear how the parasite senses changes in sugar levels. There are several possibilities, including a glucose-responsive receptor on the cell surface and the involvement of glucose metabolism. The authors found that a glucose-resembling molecule, which could not be metabolized by the parasite, elicited similar results to glucose itself. This suggests involvement of a glucose-responsive receptor. Nevertheless, further study is needed to establish the precise mechanism. While sleeping sickness is fatal if left untreated, the last major epidemic ended in the late 1990s. Moreover, the World Health Organization aims to eliminate sleeping sickness as a public health threat by 2020. However, this study will not only inform the development of vaccines or treatments for humans, but also of protective agents for cattle still often affected by African Trypanosomiasis. Peer edited by Joanna Warren and Jack Sundberg. This entry was posted in Blog and tagged Glucose, Sleeping Sickness, Trypanosoma brucei, Tsetse fly by Dominika Trzilova. Bookmark the permalink.